Due to the steep ecliptic (green line) this month, Mercury delivers an excellent morning apparition for mid-northern latitude observers. On September 12, the planet will reach its widest angle west of the sun and peak visibility. Look low in the eastern pre-dawn sky between 5:30 and 6 a.m. local time. In a telescope Mercury will exhibit a waxing half-illuminated phase. Once each year in the fall, Mercury moves into favorable position to be seen in the morning twilight sky. During this 10-day time frame, the so-called "elusive planet" is not so difficult to see after all. If there is a planet that has gotten a bad rap for its inability to be spotted, it's Mercury. Here is just one example: In their book "New Handbook of the Heavens" (McGraw Hill, 1948), authors Hubert Bernhard, Dorothy Bennett and Hugh Rice discussed how to observe the bright naked-eye planets, and they played up Mercury's reputation for being hard to see. Nonetheless, we are currently within a three-week "window of opportunity" for getting a good look at Mercury in the early-morning dawn sky. Mercury is called an "inferior planet" because its orbit is nearer to the sun than Earth's is. Therefore, Mercury always appears from our vantage point to be in the same general direction as the sun. In ancient Roman legends, Mercury was the swift-footed messenger of the gods. The planet is well-named, for it is the closest planet to the sun and the swiftest of the sun's family: It averages about 30 miles per second (48 km/s), making its yearly journey around the sun in only 88 Earth days. Interestingly, it takes Mercury 59 Earth days to rotate once on its axis, so all parts of its surface experience periods of intense heat and extreme cold. Although its mean distance from the sun is only 36 million miles (58 million km), Mercury experiences by far the greatest range of temperatures: from minus 300 degrees Fahrenheit (minus 184 degrees Celsius) on its night side to nearly 900 degrees F (482 degrees C) on its day side. At one time, this planet actually had two names, as skywatchers didn't realize it could alternately appear on one side of the sun and then on the other. The planet was called Mercury when it was in the evening sky and Apollo when it appeared in the morning. It is said that Pythagoras, in about the fifth century B.C., pointed out that they were the same. Mercury rises before the sun all of this month, and is surprisingly easy to see from now through Sept. 26. All you have to do is look low above the eastern horizon during morning twilight, from about 30 to 45 minutes before sunrise, for a bright yellowish-orange "star." As a bonus this weekend, Mercury will be approaching the much dimmer blue-white star Regulus in the constellation of Leo, the lion. 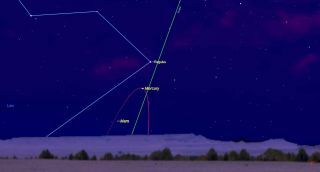 Rising 1 and a half hours before the sun on Sunday morning (Sept. 10), the Americas will see this zero-magnitude planet pass just 0.6 degrees to the lower right of the bluish first-magnitude star Regulus. Mercury will appear more than 3.5 times brighter than Regulus, and against the brightening dawn twilight, you might want to use binoculars to more readily pick out the star. On Sunday, Sept 10 low in the pre-dawn Eastern sky, Mercury will sit only 0.6 degrees (less than a finger width) to the right of the bright star Regulus. Dimmer reddish Mars will sit 3 degrees below the pair. For the best chance of seeing them, look between 5:45 and 6 a.m. local time. Located about 4 degrees to the lower left of Mercury and Regulus will be an even dimmer object shining with an orange-yellow hue. (Your clenched fist held at arm's length measures about 10 degrees of the sky.) That dimmer object is Mars — which has been invisible through much of the summer, languishing close to the sun and obscured by its dazzling light. But now, finally, Mars has begun to move out of the glare of the sun and, in the coming days and weeks, will become increasingly easier to see. Finally, on Sept. 18, about an hour before sunrise, check out a beautiful array low in the east-northeast sky. Venus will shine with its usual superior brilliance. Regulus will hover above it, while below it will be a skinny waning crescent moon. Mars will be to the lower left of the moon, and Mercury will be below it. The speedy planet will still be easily visible as late as Sept. 26. Though it will be nearer to the sun, Mercury will have brightened to magnitude -1.3 — nearly as bright as Sirius, the brightest star in the night sky. Thereafter, it will drop back down under the dawn horizon. Joe Rao serves as an instructor and guest lecturer at New York's Hayden Planetarium. He writes about astronomy for Natural History magazine, the Farmer's Almanac and other publications, and he is also an on-camera meteorologist for Verizon Fios1 News in Rye Brook, New York. Follow us @Spacedotcom, Facebook and Google+. Original article on Space.com.